Yesterday Kodak announced the ESP 7 and ESP 9, the two new wireless inkjet multifunctions. Kodak claims these multifunctions can print up to twice as many photos and documents for the money they cost. This feature saves around $110 a year on ink compared with other leading consumer inkjet printers on the market. Both the ESP 7 and ESP 9 use Kodak’s pigmented inks that come in a simple two-cartridge setup: a black cartridge for $9.99 and a five-ink color cartridge for $14.99. Based on independent testing by Wilhelm Imaging Research, prints from the two printers should last for at least 120 years in dark storage such as in an album. The ESP 7 All-in-One Printer costs $199.99 and bolsters a 3-inch color LCD display as well as memory card and USB slots so you can view, edit and print images without use of computer. The ESP 7 supports Wi-Fi and Ethernet connectivity and can perform double-sided printing with built-in duplex unit. According to Kodak, it takes only 28 second to produce a 4×6-inch photo on the ESP 7. When it comes for document printing, the device speed reaches up to 32 pages per minute in black and 30 ppm in color. 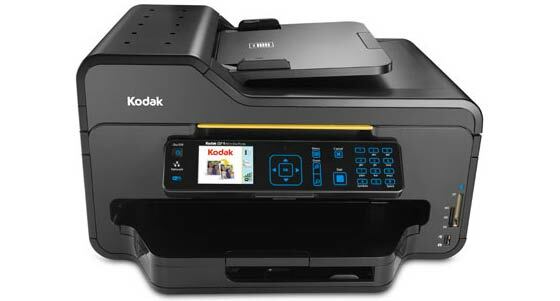 The senior model, Kodak ESP 9 priced at $299.99, offers larger functionality: it has fax capabilities, an auto-document feeder, and a 10-inch one-touch control panel. Kodak’s Home Center Software includes facial retouch capabilities that enable consumers to enhance their personal photographs by automatically reducing blemishes and augmenting facial features. Both printers have an intelligent paper tray system, which automatically adjusts settings based on paper type, size, and amount. This entry was posted on Tuesday, September 23rd, 2008 at 5:42 am	and is filed under inkjet, Kodak, multifunction. "HP LaserJet P3005x Laser Printer Review"
"Paper, Ink and Sunlight Make a Lab-on-a-Chip"